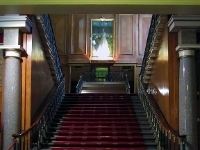 1 The Foyer Staircase. 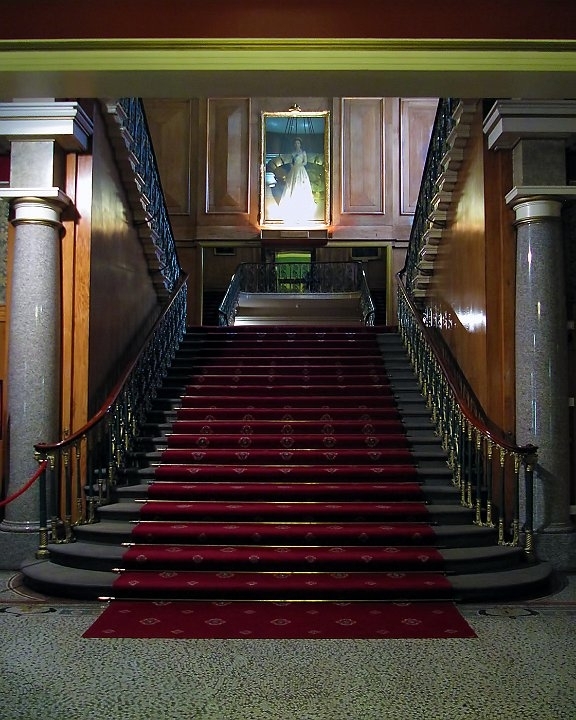 This magnificent staircase goes up to the first floor from the foyer. 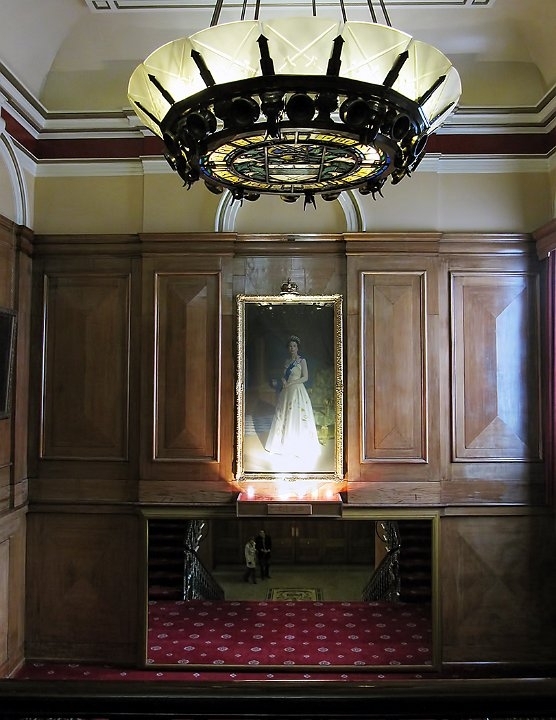 At the top of the first flight of stairs is a portrait of the Queen above a very large plate glass mirror. 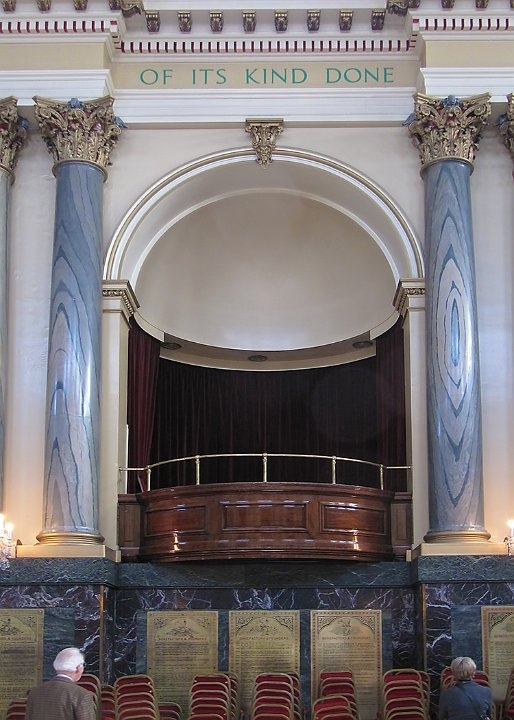 The double second flight of stairs can be seen in the mirror. 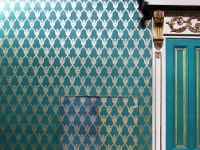 Looking closely at the portrait you can see the reflection of a chandelier in the glass. 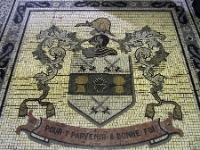 2 The Mosaic Crest And Motto. 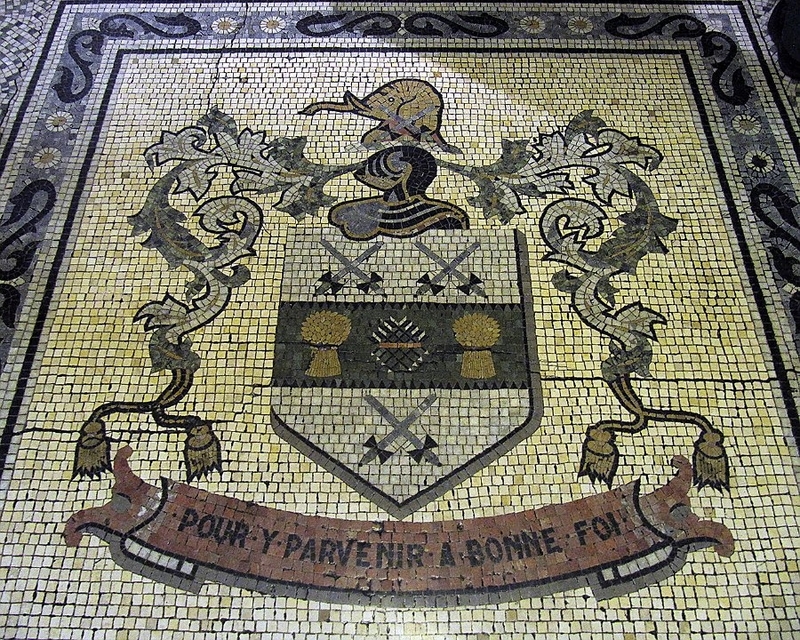 This mosaic of the coat of arms is in the floor of the foyer looking towards the grand staircase. 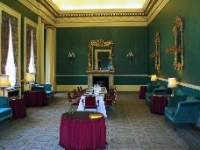 3 The Reception Room And Drawing Room. 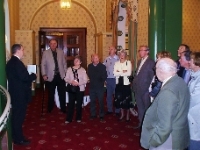 Members, wives, and partners, taking coffee in the drawing room and reception room. 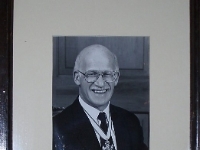 The walls are decorated with portraits of past Master Cutlers. There is also a part finished painting of Prince Philip as a young man. 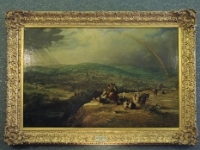 4 A Painting By H.P. Parker 1843. 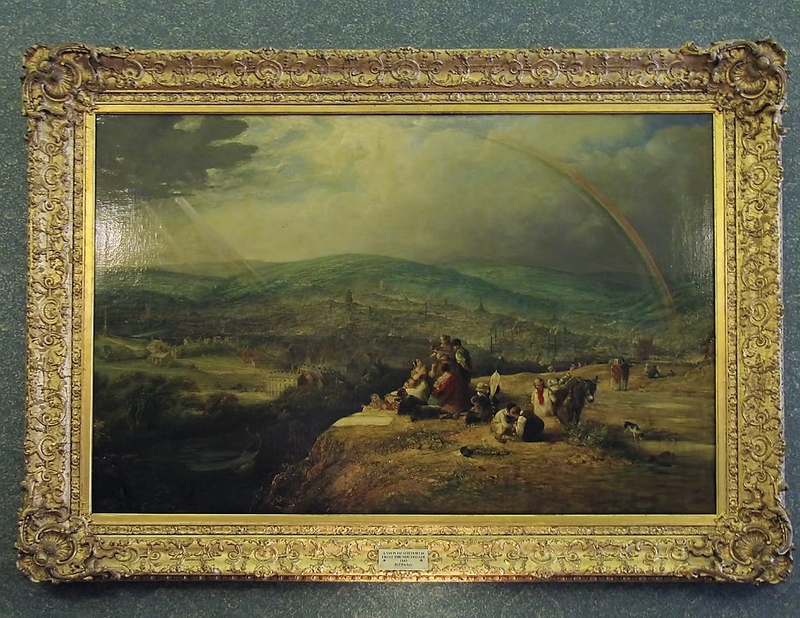 A view of Sheffield from the southeast, painted in 1843 by H.P.Parker. The area today is known as Sky Edge. 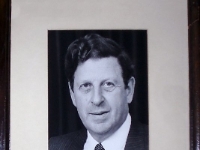 5 Sir Stuart Goodwin. 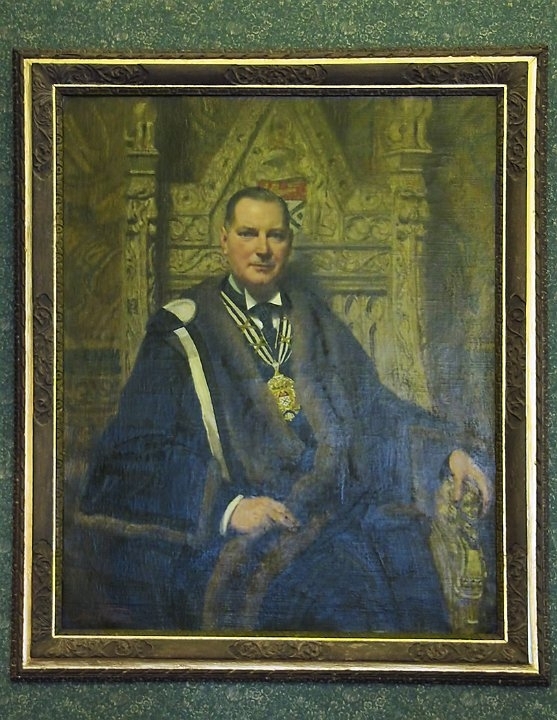 This is a portrait of Sir Stuart Goodwin, a great benefactor to the city of Sheffield. 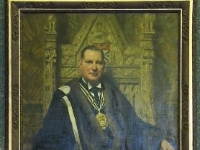 The portrait was painted when he was the Lord Mayor but he never had the honour of becoming a Master Cutler. 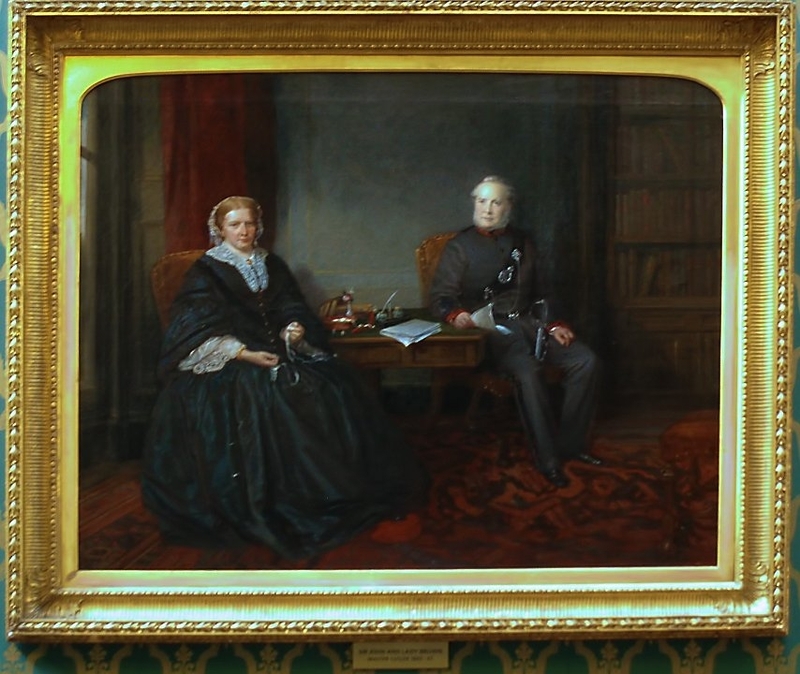 6 Sir John And Lady Brown. 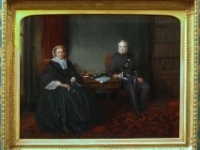 A painting of Sir John and Lady Brown, Master Cutler 1865 - 1867. 7 The Anti-room. 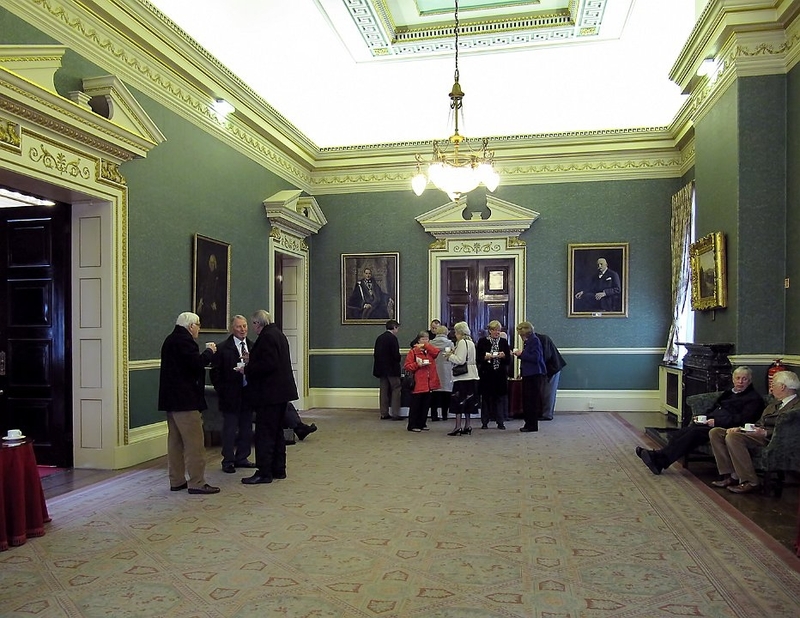 A general view of the anti-room, off the drawing room, reception room. 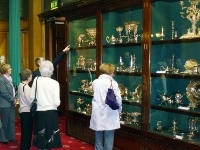 The mirrors hanging on the right hand wall were originally bought, complete with frames and candelabras for 1s - 6d each. 8 Dinner Is Served. 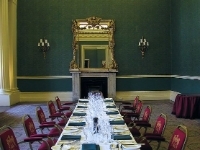 A table laid for dinner in an anti-room off the drawing and reception room. 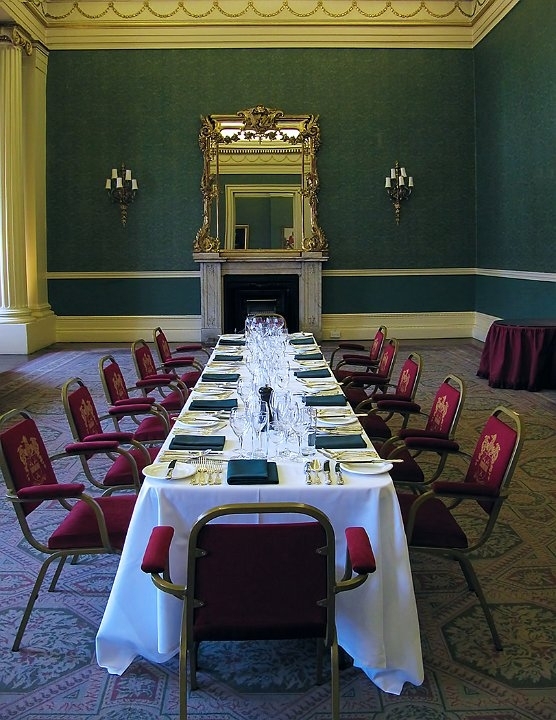 Twelve business men dine here on a regular basis to celebrate various occasions such as their birthdays. 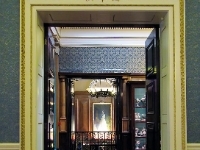 9 The Reception Room Doorway. 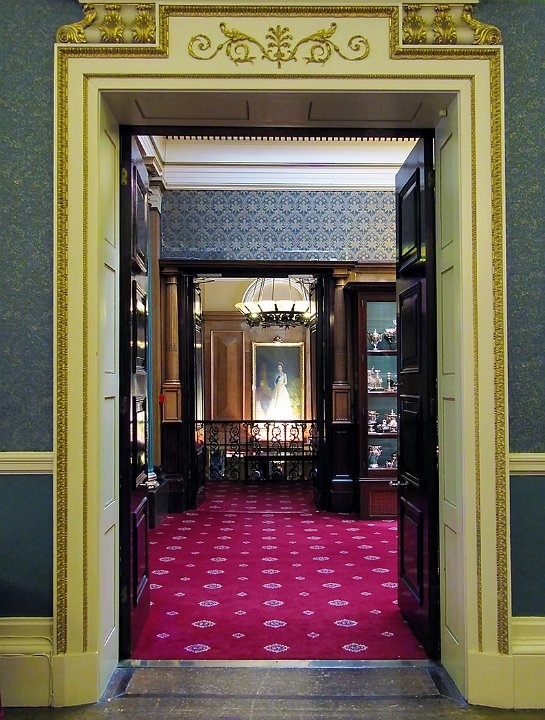 Looking through the drawing room doorway, across an adjacent room at the Queen's portrait on the stairs. 10 The Portrait Of The Queen. 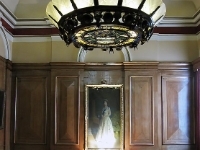 The large chandelier, the portrait of the Queen and the large mirror at the head of the first flight of stairs on the grand staircase. 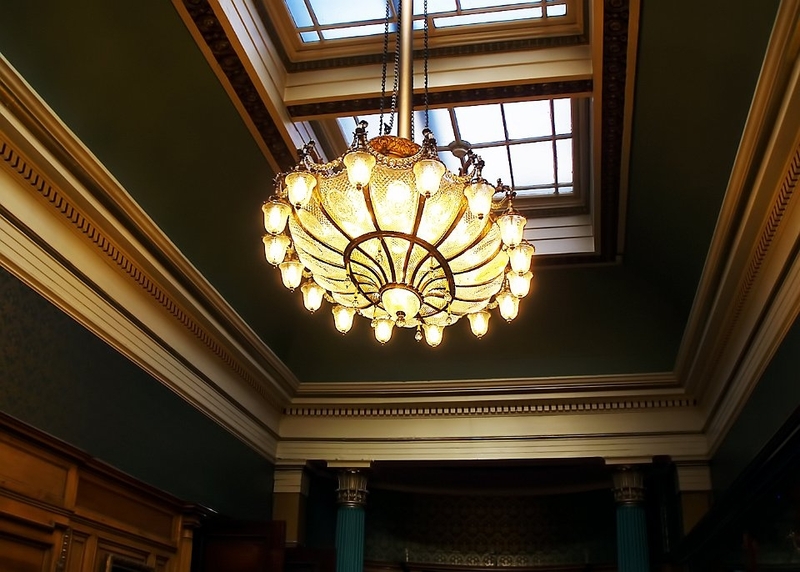 11 The Chandelier Over The Stairs. 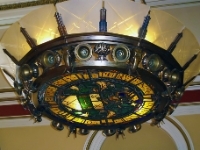 A close up of the chandelier showing the coat of arms and the motto. 12 John T. Harvey. 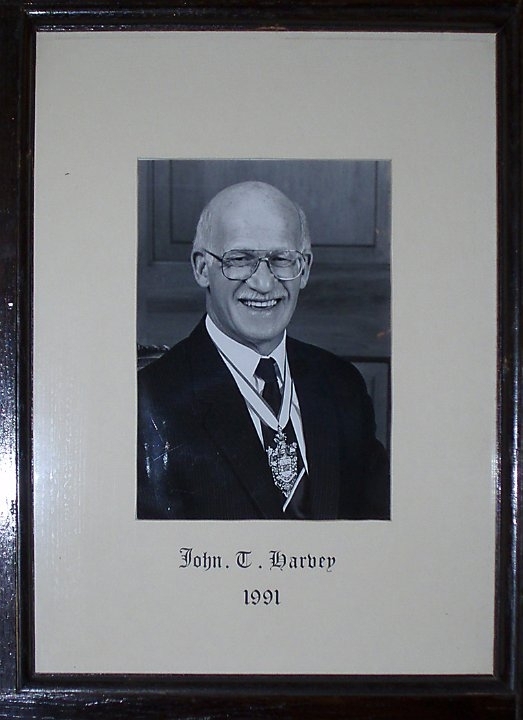 A Photograph of Dr John T. Harvey taken in 1991 when he was Master Cutler. 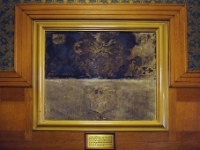 The photograph is hanging in the chambers of the Master Cutler. 13 Peter Lee. 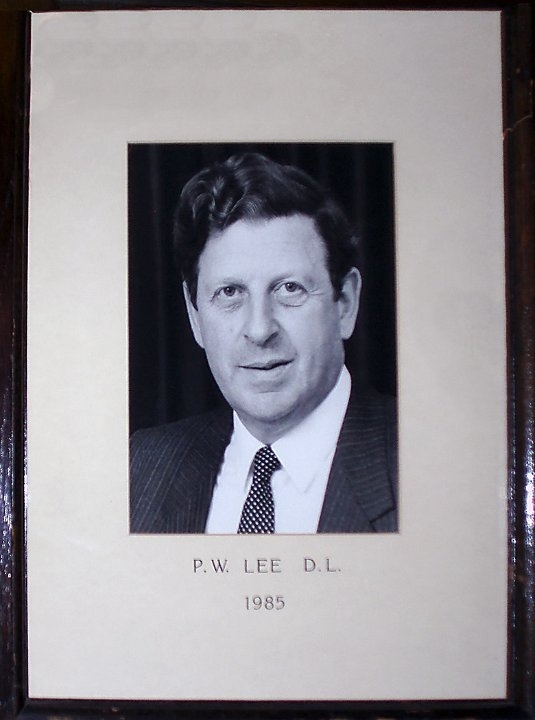 A photograph of Peter Lee, Master Cutler in 1985, also hanging in the chambers of the Master Cutler. 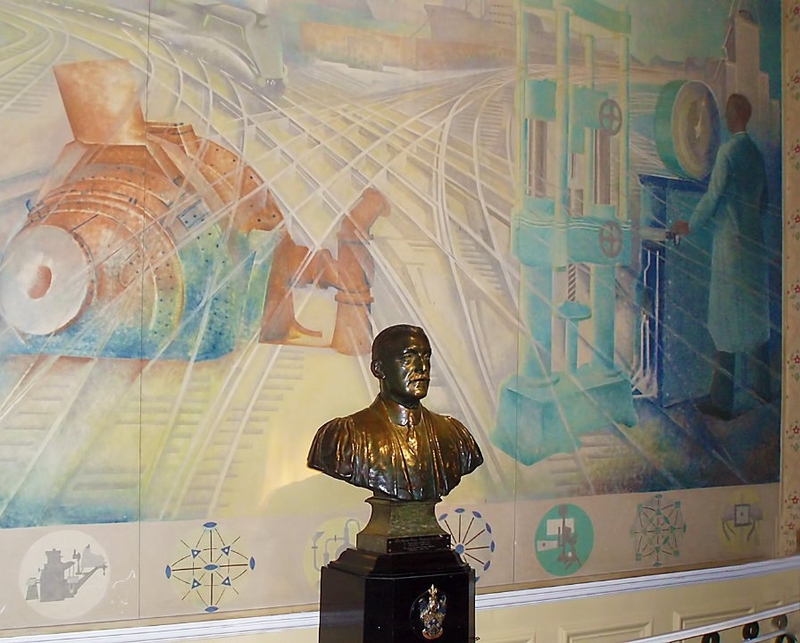 15 A Bust Of Sir John Hadfield. 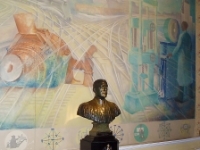 A bronze bust of Sir John Hadfield in the entrance to the Hadfield Hall. 16 The Entrance To The Hadfield Hall. 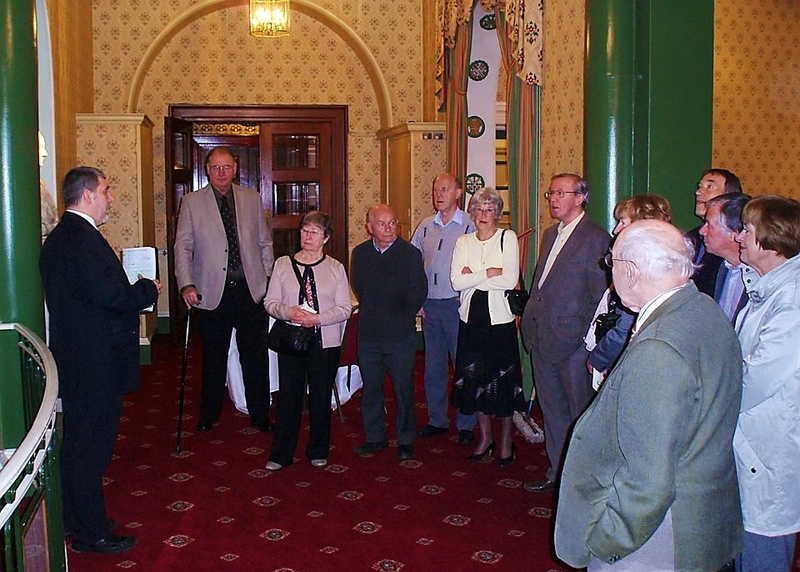 A group of members with their wives and partners in the entrance to the Hadfield Hall. 17 The Cutlers' Coat Of Arms In Wood. 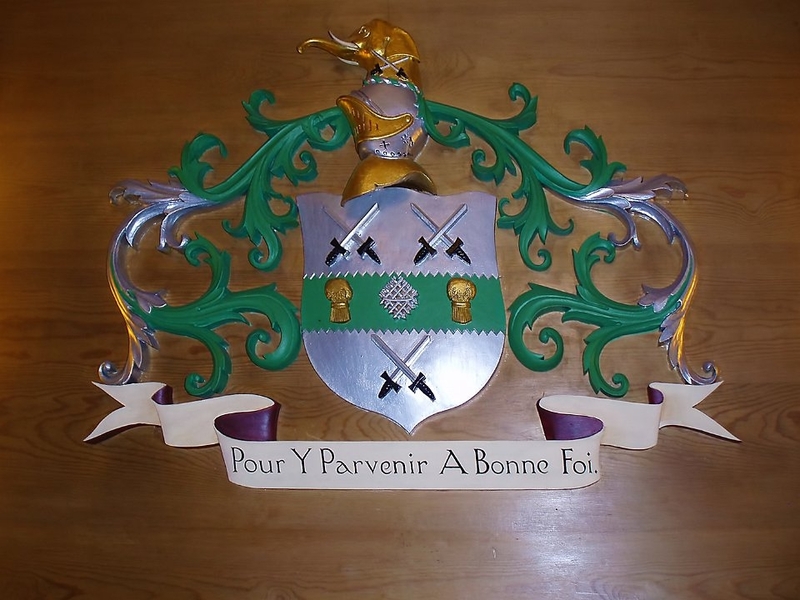 The coat of arms and motto carved in wood. 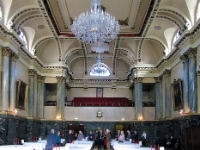 18 The Grand Hall. 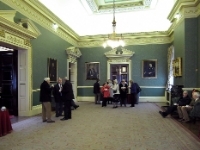 A view of the Grand Hall looking at the Ladies Gallery. 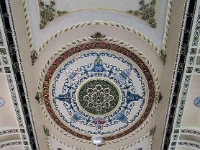 19 The Ceiling Of The Grand Hall. 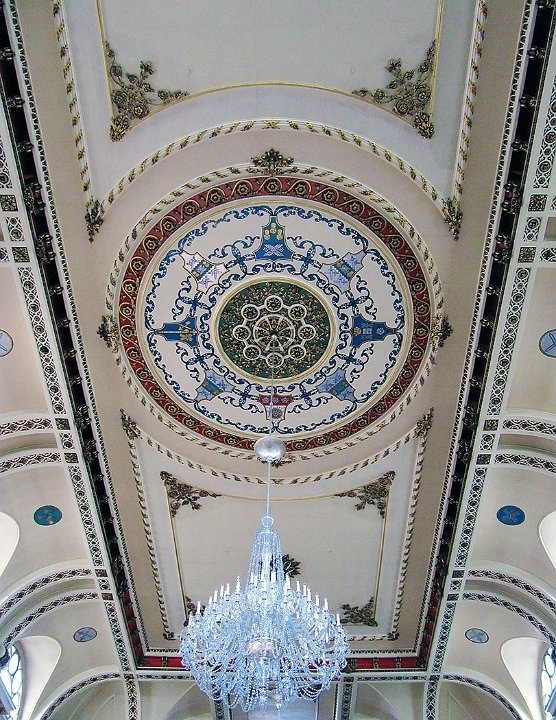 A view of part of the ceiling , showing the centre chandelier in the Grand Hall. 20 The Fanfare Balcony. The Fanfare Balcony. 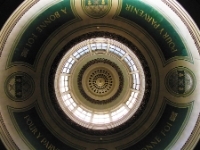 As it's name implies it is used for trumpet fanfares on state occasions. 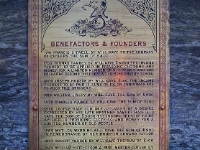 21 A Plaque Of Benefactors. 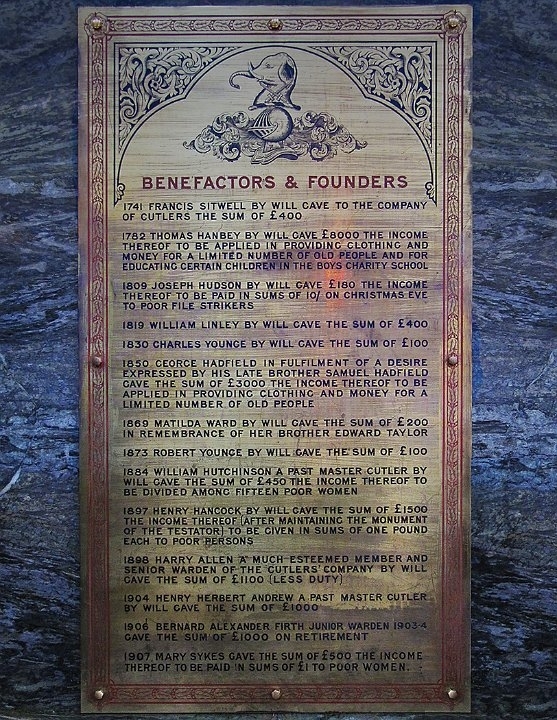 One of several plaques in the Grand Hall showing benefactors and their contributions. 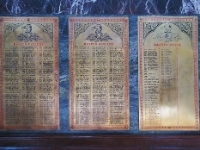 22 Plaques Listing Master Cutlers. 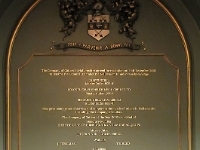 Three plaques in the Grand Hall showing the Master Cutlers since 1624. 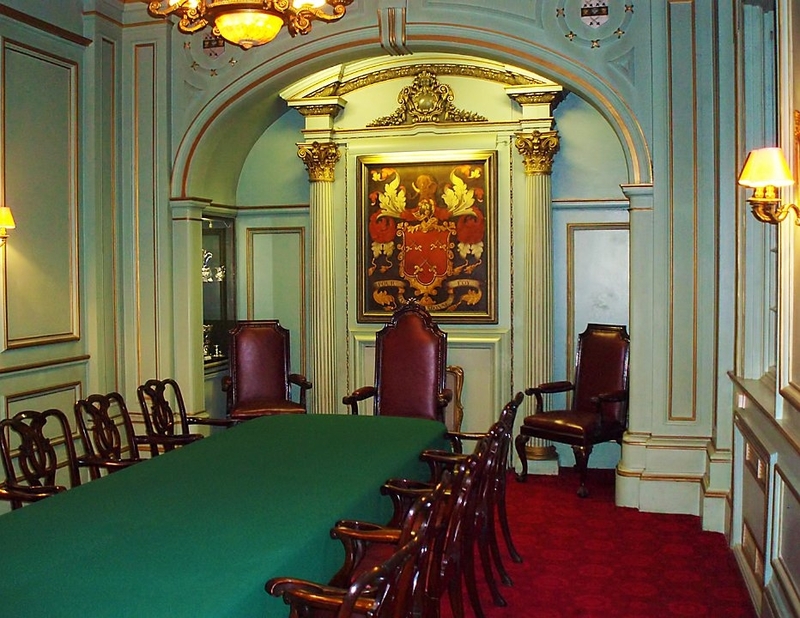 24 The Neill Room. 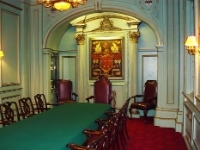 A view of the top of the table in the Neill Room.The two chairs, either side and to the rear of the Master Cutlers' chairs are for his two successors. 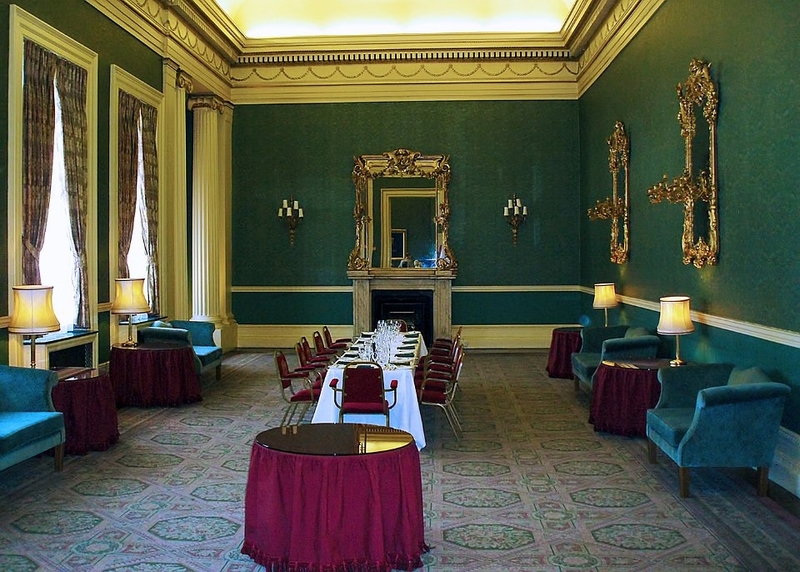 25 The Neill Room. 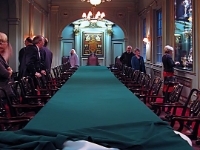 A view down the long table in the Neill Room. 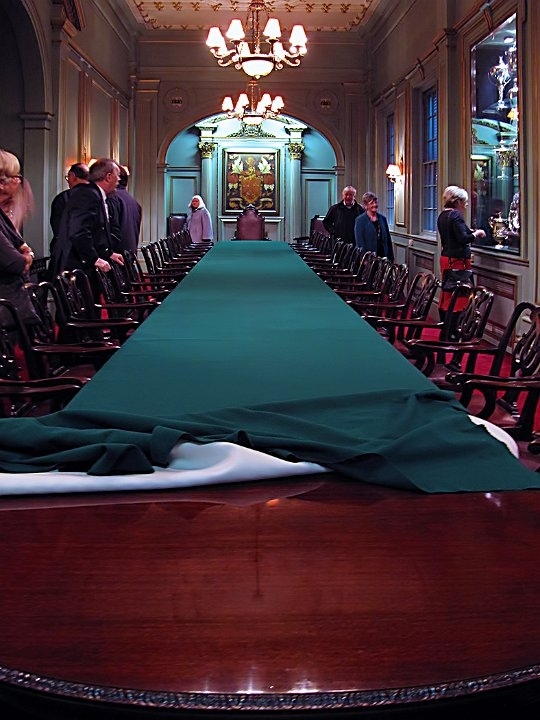 When the council is in session the Master Cutler sits at the top end of the table. 26 Stones Of The Cutlers' Company. 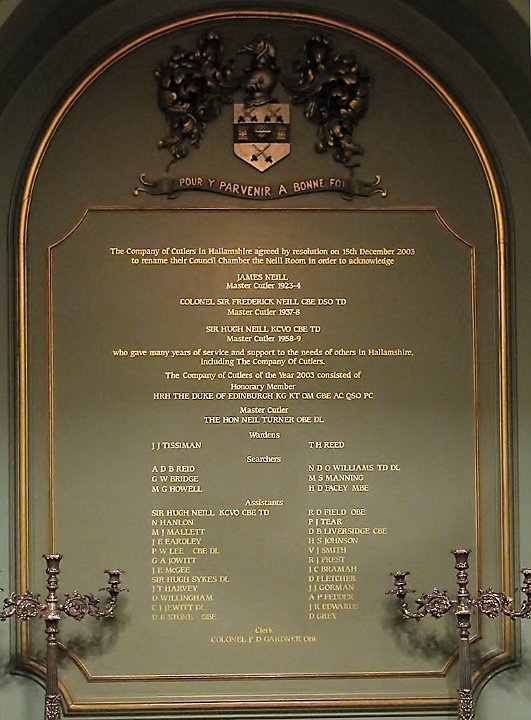 The plaque below the stones says, "These stones, representing the arms of the Cutlers' Company, were discovered at No 47-49 West Bar Sheffield, which formerly belonged to Mr Tobias Ellis, Master Cutler in the year 1718, and were presented to the Cutlers' Company by Vivian Sutcliffe and removed to the Cutlers' Hall in May 1912." The date on the stone is 1692. I don't think that the stone mason had ever seen an elephant. 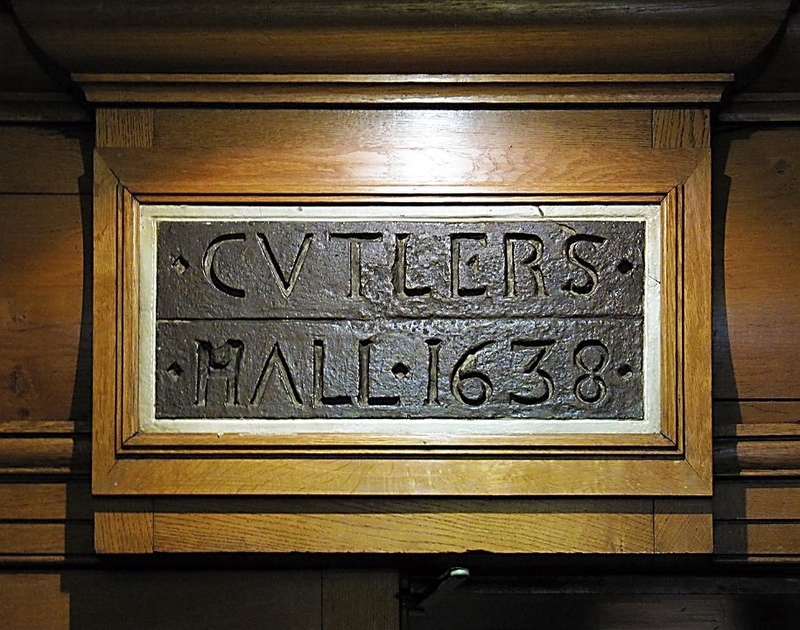 27 Cutlers' Hall 1638. 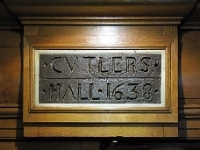 A cast sign from the original Cutlers' Hall. 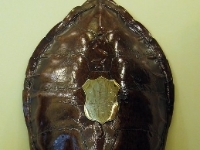 28 The Turtle Shell. 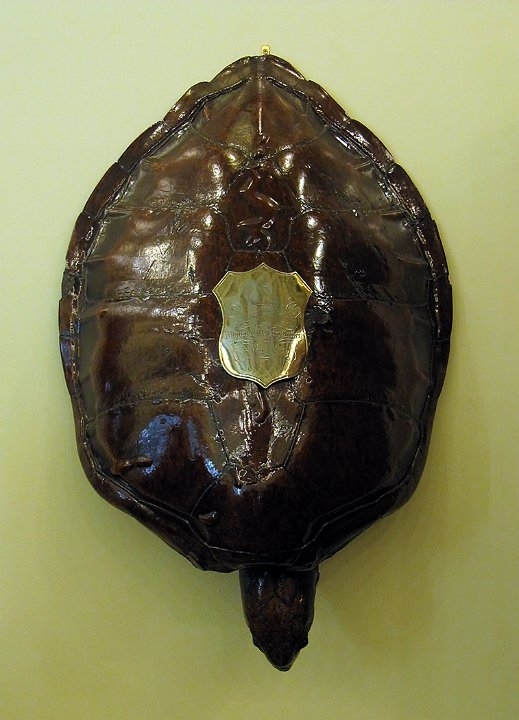 This is a large turtle shell and the story goes that it used to be used for serving turtle soup, until one day a chef was bitten quite seriously by a turtle. Since then, turtle soup has not been served. 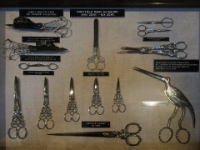 29 Scissors from The Great Exhibition Of 1851. 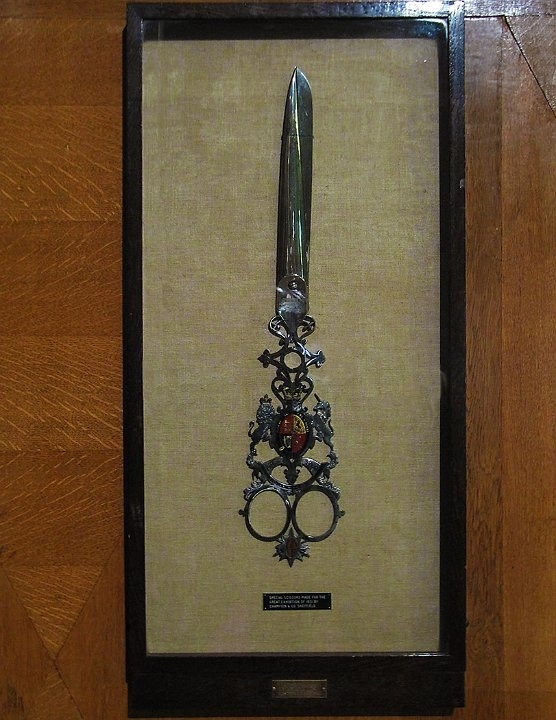 These scissors are used now for cutting ribbons at opening ceremonies but originally there were six pairs made for the Great Exhibition in 1851 by Champion & Co., Sheffield. The other five have either been lost or stolen. 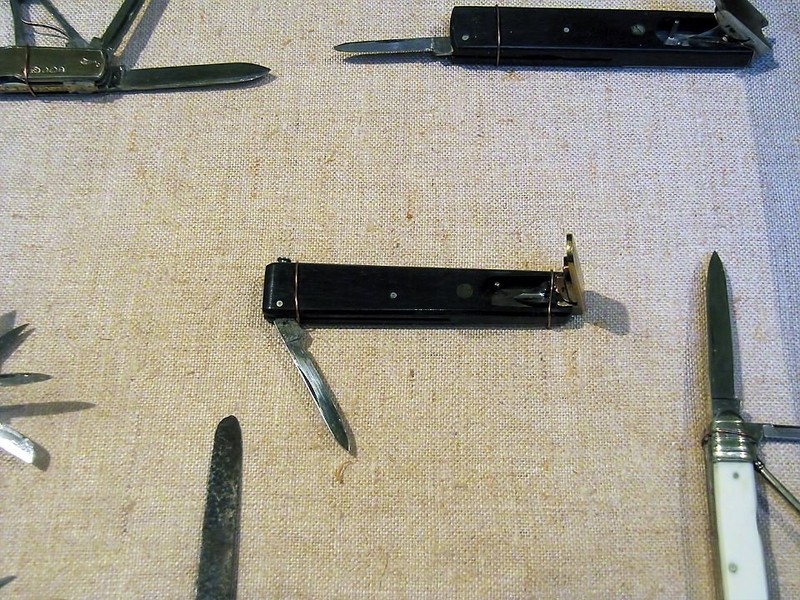 30 The Norfolk Knife. 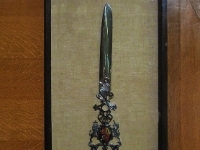 The famous Norfolk Knife, created by Joseph Rodgers & Sons at their works on Norfolk Street. 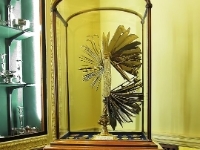 It was manufactured for the Great Exhibition in 1851: it has 75 blades and took two men two years to build. 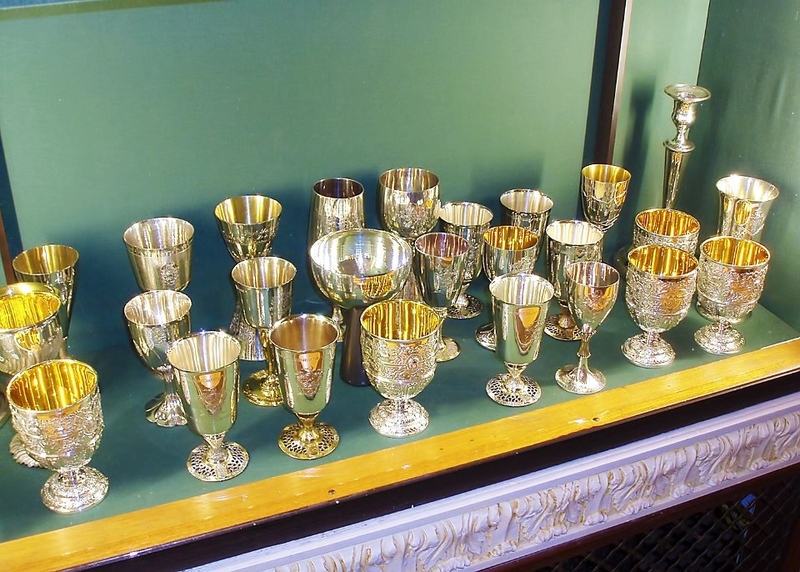 31 Silver Goblets. 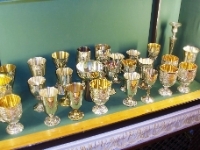 Silver goblets on display in the room containing the Norfolk Knife. 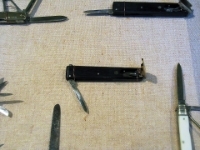 32 A Collection Of Penknives. 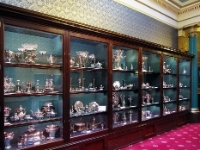 A display cabinet of pen knives. 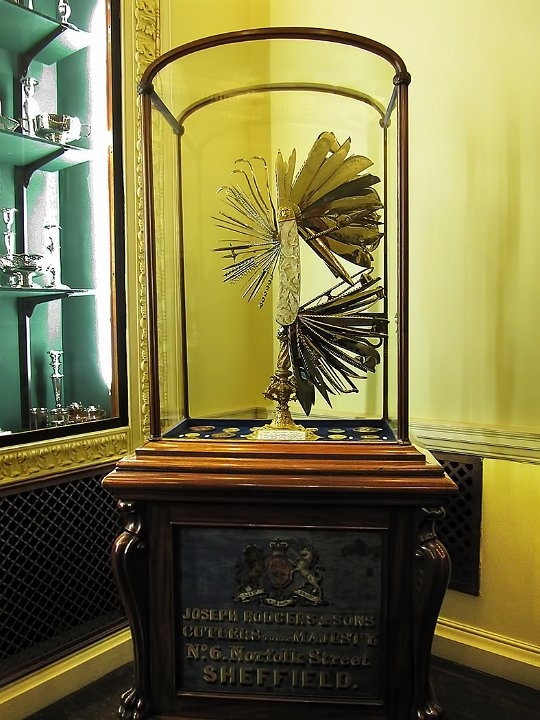 The knife in the top right and the knife in the centre of the photograph have a device for cutting the nib into a feather quill: hence the name,"Pen Knife." 33 A Collection Of Scissors. 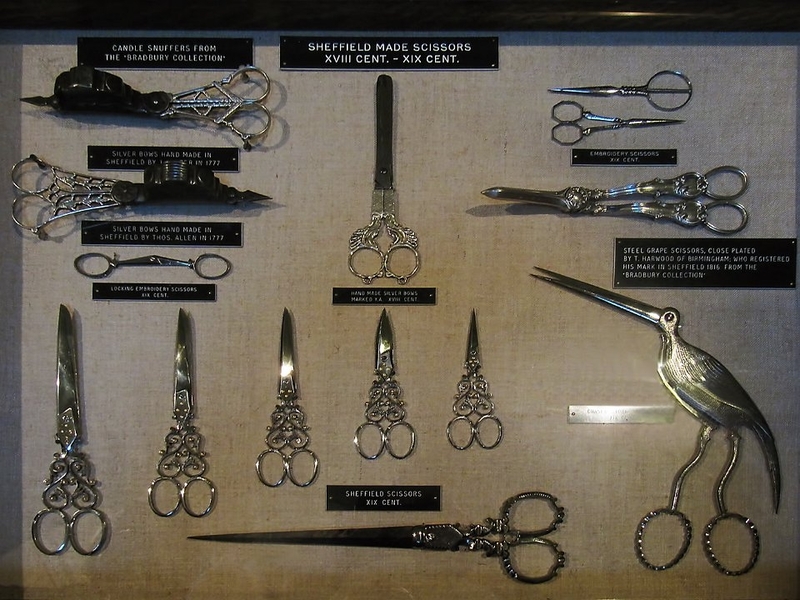 A Collection Of Scissors & Snuffers XVIII & XIX Centuries. 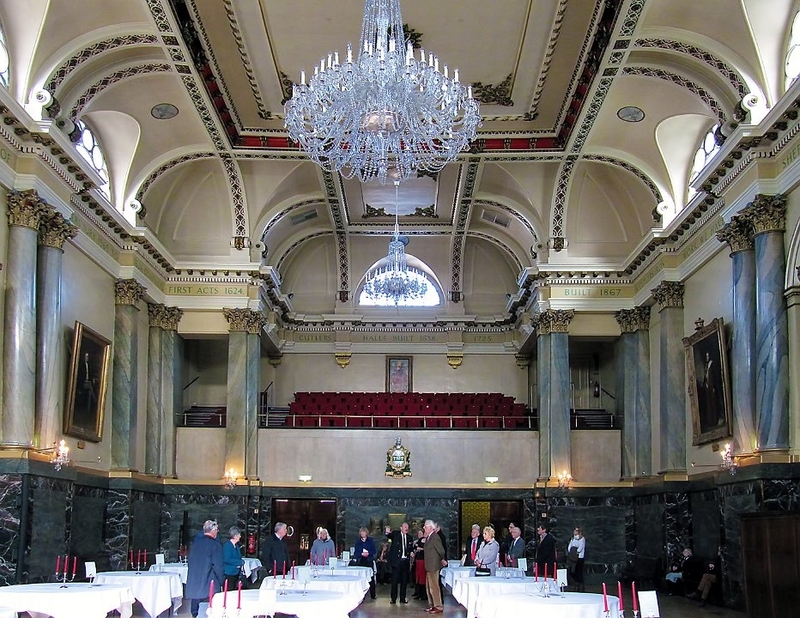 34 The Central Sky Light In The Old Banqueting Hall. 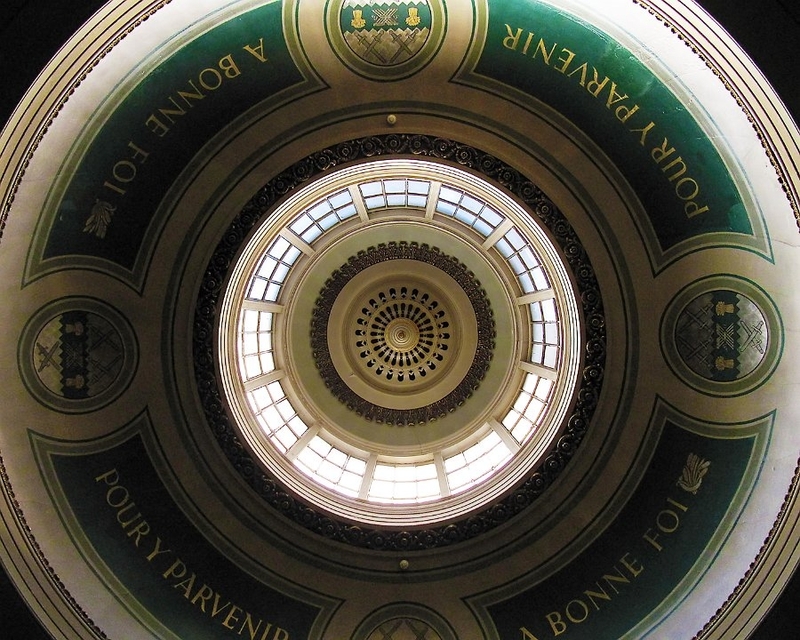 The central sky light in the Old Banqueting Hall. 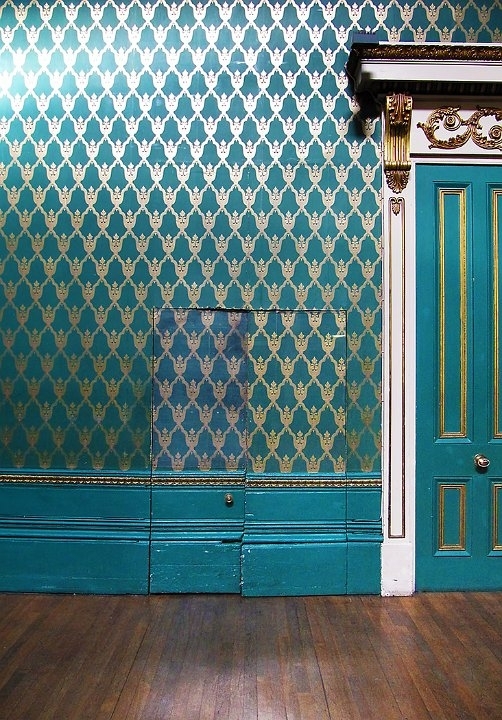 35 A Concealed Door In The Old Banqueting Hall. 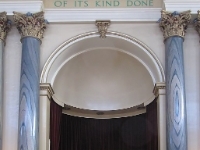 A cocealed door in the Old Banqueting Hall. 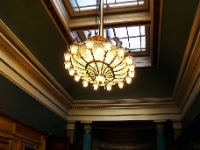 36 A Chandeliar From The R.M.S. Olympic. 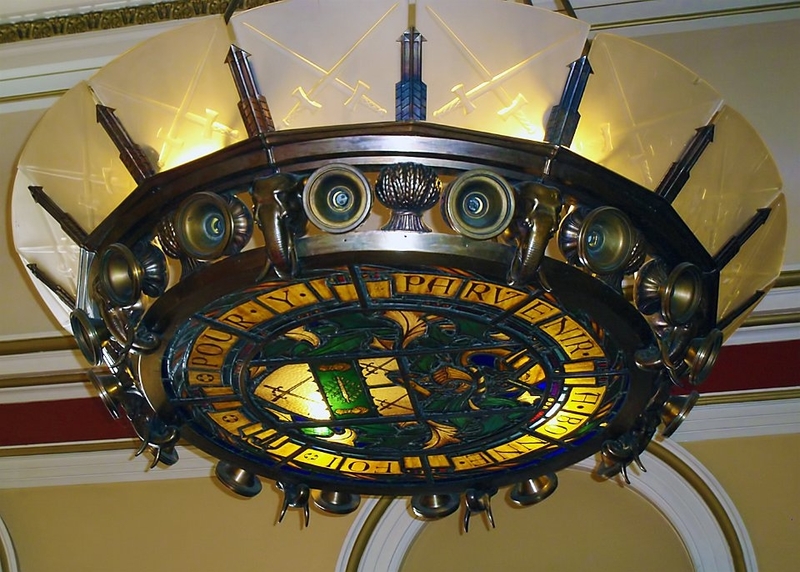 A Chandelier from RMS Olympic, a sister ship to the Titanic. 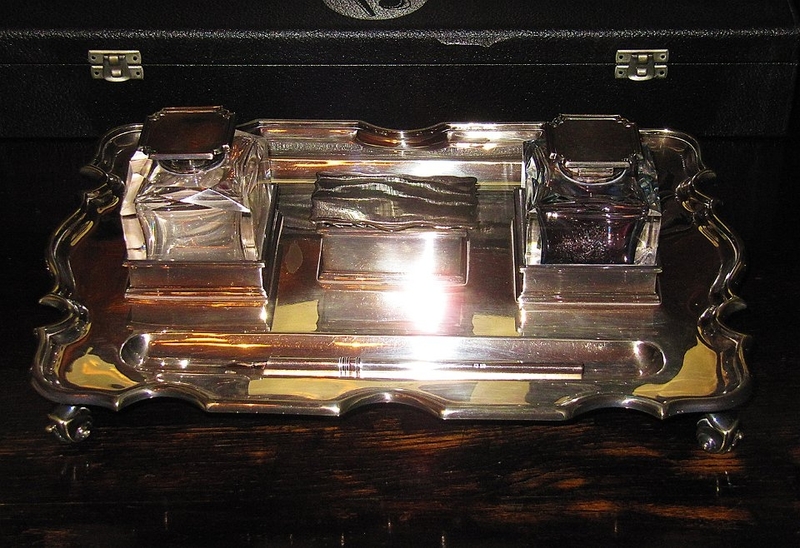 37 The Coat Of Arms On A Silver Bowl. 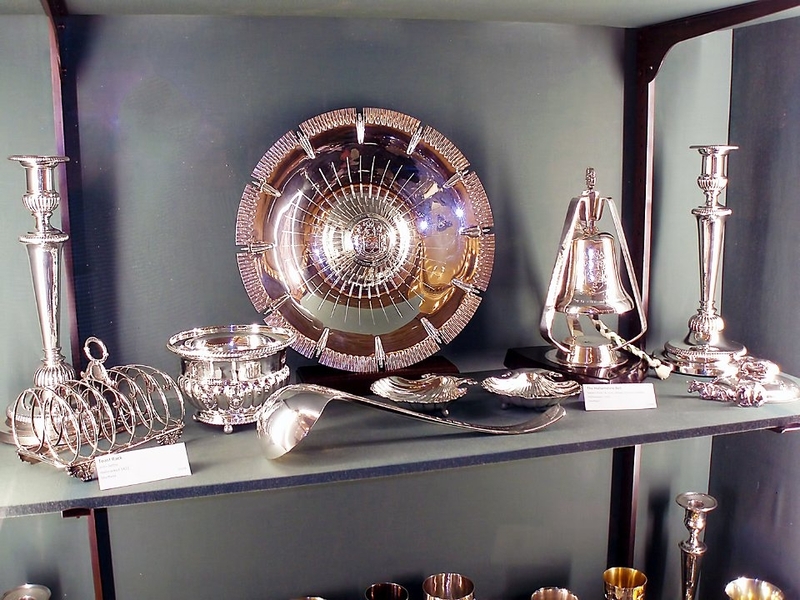 All the items in this display are solid silverand were made about 1860. 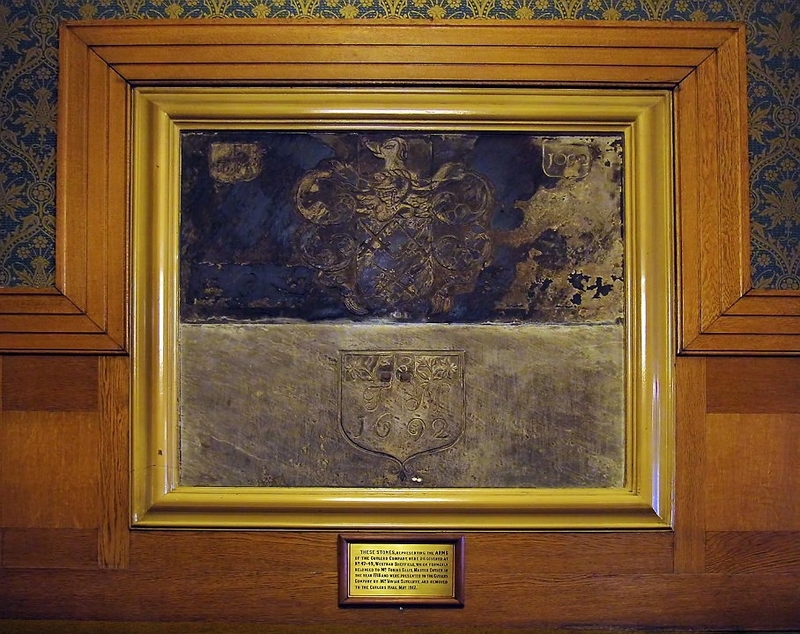 The bowl in the centre has the coat of arms on a raised central portion. 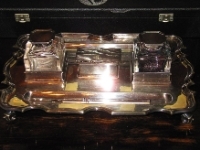 38 Sheffield Silver. Another view of the cabinet showing articles made from solid silver. 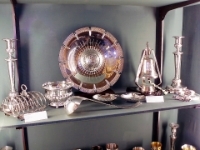 The oldest pieces are on the left and the more modern ones are to the right. 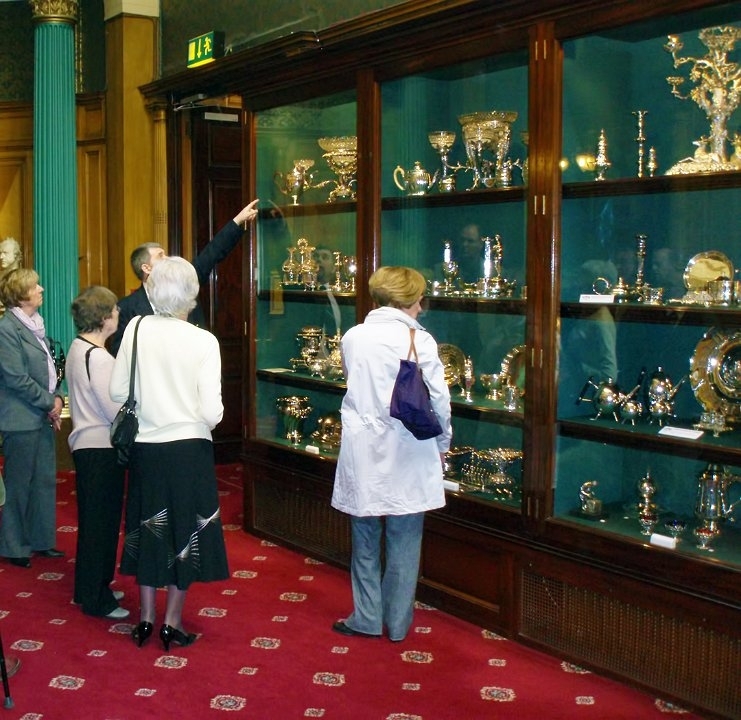 hand cabinet contains articles made from Sheffield Plate, consisting of a layer of copper sandwiched between two layers of silver.